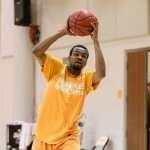 For the Vols, postseason dreams start with beating Vanderbilt Thursday night. Tennessee players who were on the 2013-14 Sweet 16 team received rings on Tuesday. Tennessee got it down to the final possession against Ole MIss, but a Josh Richardson jumper barely was off the mark and the Vols dropped another tough one. 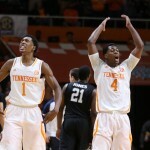 The Vols travel to Ole Miss Saturday night (7:30 pm, ESPNU). 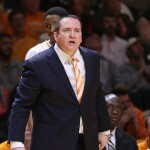 Probable starters, predictions and keys to a Tennessee upset. 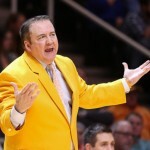 We talk Tennessee's potential under Tyndall, which Vol you'd most want to be snowed in with, Skoal vs. Copenhagen and more in Insider Mailing. 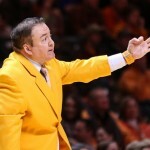 Tennessee accomplished some of what it wanted to do in an upset bid of Kentucky, but not enough to beat the top-ranked 'Cats. 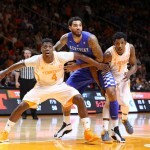 5 takeaways from the Vols' 66-48 loss to Kentucky on Tuesday night in Thompson Boling Arena.